I just tried out new beta version Classic shell. It can have taskbar changed to whatever image one has around. I used a small menu bitmap. Got it working in less than 2 minutes. People should be able to make their own fast too. Thank you Ivo, and gang. Ive PM'ed Ivo about a potential Taskbar skin sub-forum, Until then: I designate this the official Taskbar skin thread! 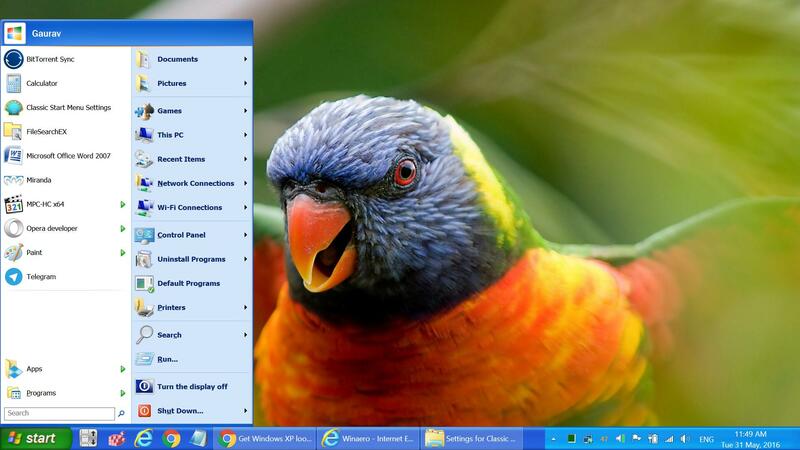 Oh and that Snekbar needs a matching menu...perhaps depicting a half-swallowed Win7 menu? Let me guess...we aren't going to be seeing Taskbar button skinning anytime soon (if ever)? ...wait, would that kinda mandate a special skin format for the Taskbar or something? .-. The problem with the button skinning is that buttons need a large number of custom images. The button can be with or without text, grouped or not. Buttons have many states - normal, hover, pressed, active, progress, error, etc. 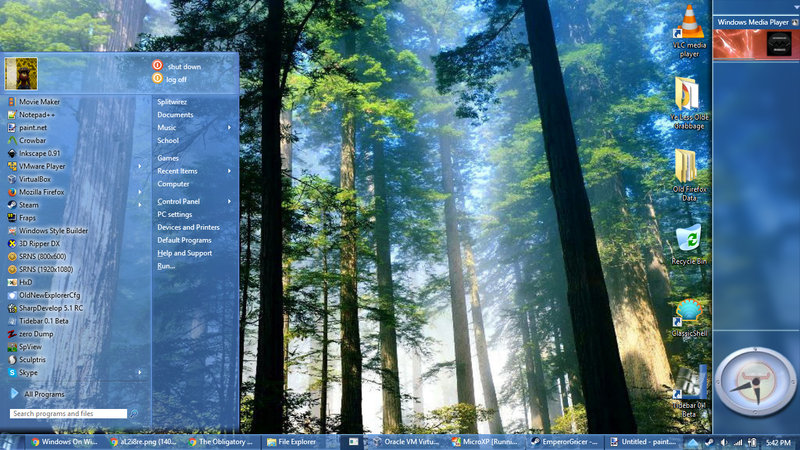 And on top of that the buttons look different on each of the 4 taskbar positions. I'm sure there are specific requirements for each Windows version as well. If you want to do this, you are better off with a complete new theme. Umm...in Windows 10, the buttons don't use Visual Styles. They can't be skinned by normal means. That's the whole reason I asked. I think I may have failed to establish my point. I meant the application buttons. Also those buttons aren't images, they're...vector-based or something. Like the background. And I mean the application buttons, not search/task view/start. Close. I don't mean the icon itself, I mean the button which surrounds it while hovered over, when opened, etc. Does that make more sense? .-. That thing. You can't skin those on Windows 10. Yeah. In Windows 10, themes can't touch dis, and given that background skinning is already available in Windows 7 and 8.1 , well...it just makes sense ._. and yea I would agree that it should have 9 slices like the menu buttons. Well, time to take advantage! I knew it wouldn't be long before an xp taskbar skin popped up especially since its so easy to skin. Hmm...I'll see if I can get the taskbar images from every other version of Windows. Yes, skinning requires the Windows theme engine, which is disabled for the Classic Theme on Windows 7. I don't know what Classic Theme for 10 you are talking about. Maybe it's the high contrast ones? It's kind of fun going back in past with wild colors of history taskbars. The taskbar options do have limitations, as it's static. Still mighty fine if one is willing to alter the taskbar image to match their own system. In my case I'm on Win 10. I altered the black area to fit my setup. I put in no border line transition between taskbar and tray image. That way, you can use Gaurav's method, by reducing the right horizontal border 170 pixels and lower. With each lower number, the tray transition will move to the left. Last edited by juniper7 on Tue May 31, 2016 11:58 am, edited 1 time in total. No, that's Aerolite. When I say Classic Theme on Windows 10, I mean Classic Theme on Windows 10. Anyone else see the issue here? ._. Well, it doesn't seem to be a standard Windows feature. Non-standard features like that are not supported. You should not mix multiple skinning solutions, like a third party theme + Classic Shell. Only one system can be in charge of the taskbar look. It is a standard Windows feature - this is the same Classic Theme as was present in Windows 95 - 7. 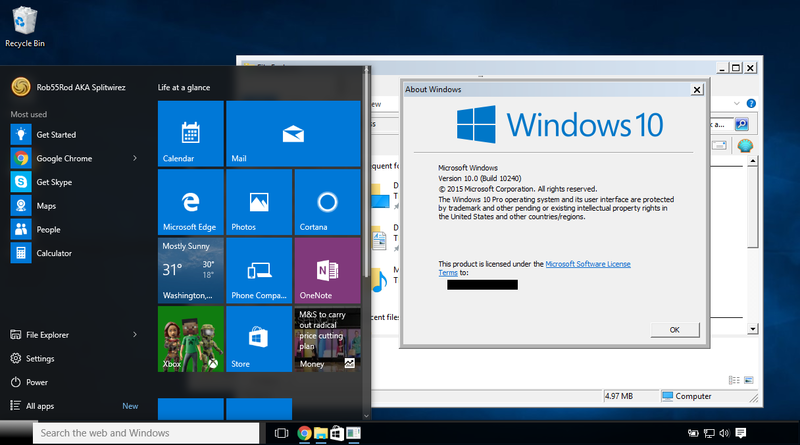 The only new part is the means to access it and the ability to do so without disabling Dwm. However, I strongly recommend you do so in a Virtual Machine, as this application is still in early development and has been known to cause some users' Windows 10 installs to implode and require a system restore or full reinstall. Oh, and if it were a Visual Style, it wouldn't be able to modify the Taskbar at all .__. Got it. Still, the way the taskbar skinning is done (the texture and text color, not the overall color) is by affecting the theme. No theme, no skinning. For the same reason it doesn't work on Windows 7 with Classic Theme. Well evidently the Visual Styles aren't completely disabled. Not to mention that it does sort of work...well, that depends on what you define as "work", but it does a thing, whereas on Windows 7's Classic Theme it didn't. It just doesn't do the desired thing. ...that...still isn't going to be fixed, is it? I leave my edited version below. Is it possible to totally remove the skinning from the taskbar so it to appear like other controls under the classic theme? Uh...Annixx? Isn't that what we already have? If anything, I thought we wanted to retain what little influence Visual Styles do have, e.g. text, metrics, etc. ... ._. Uh...Annixx? Isn't that what we already have? I was talking about Windows 10. Do you mean you know how to remove styling from Win10 taskbar? Yeah, just rename ClassicTheme.exe to ClassicThemeA.exe, run it, then restart explorer. Problem is, doing so doesn't do squat to resolve our issue (all it does is fustercluck the metrics, hide the start button, and break all the text), so if anything, I figure we'd want to FORCIBLY ENABLE Visual Styles. And in terms of the cosmetic issues...that isn't controlled by Visual Styles in Windows 10 regardless. I'll just put the Blue XP pngs for others in a zip. Last edited by juniper7 on Tue May 31, 2016 12:00 pm, edited 1 time in total. Last edited by juniper7 on Tue May 31, 2016 12:01 pm, edited 1 time in total. This wood taskbar is by Teschio of Woodworks. I did not try and contact him, if ok to use. Hope it's ok. It was made in 2002. Due to the large size of the wood detail, I chopped off over half of the left taskbar. Still, even having put right border as 5, the tray size does not move that much to the left. Best to not use this image, if lots of entries in tray, or your monitor is HI-DPI. You would have to make your own image in photo program, that best matches your system. Last edited by juniper7 on Tue May 31, 2016 12:03 pm, edited 1 time in total. Since the border area is untouched and only the middle portion of the texture image is stretched, I think it would be best if for the textures that you post, there was no border in the middle of the texture that separates the notification area/tray part of the taskbar, if the texture image has one in a different color. Otherwise that middle border also gets stretched. I knew that the combo taskbar/tray can never be one size fits all. That's why I put the plain image as well, for 100% workability. and the remainder on left gets stretched. It was working for me with 2 to 3 icons in the tray. Similar setup looks like it worked for SketchAnimations2 mod. From your picture, you are a power user with lots in tray. With HIDPI, 171 pixel won't be enough for your setup. Are you varying the right border amount in between 170 and 0? Everything will stretch, depending on what lower number is put in. Only proper way is in image editor, to copy a chunk of transition point and paste to the left, with right border higher number to match. But in your case with HIDPI, might as well start from scratch and make a new really wide one. Ok. I will add your type as well. This is all uncharted waters, so to speak. Might take more experimenting to find the golden way of doing it. which means tray size will increase by a smaller ratio. Last edited by juniper7 on Tue May 31, 2016 11:56 am, edited 1 time in total. But...but...but what about my Plex theme? File comment: Plexcellent taskbar. Need I say more? .___. That's a nice Plex theme. Sharp and soft borders at the same time. I think your taskbar works differently, because the tray area looks different. It's the theme that makes it look that way? Trying to figure out the menu. Looks like glow, so it's a Win7 type. 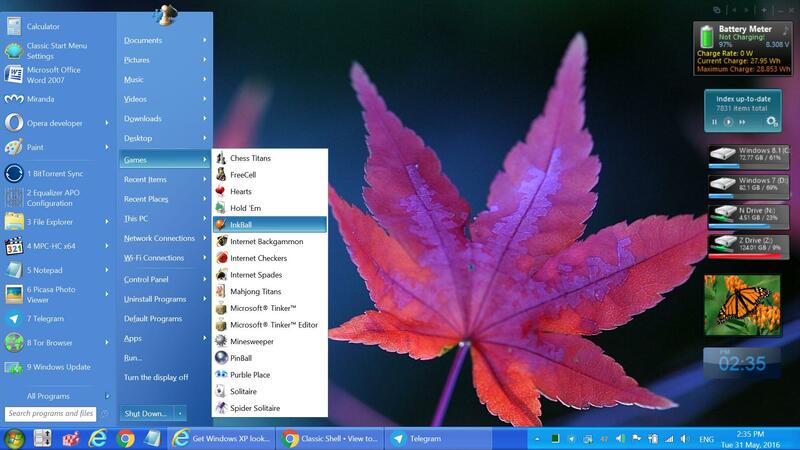 Is it Classic Shell menu, or Startisback, or Windows built in working with theme? I guess CSM can have an invisible shutdown button at top. Don't know about Log off though. Are the shut/log off icons burnt into the skin bitmap, or are they floating "Emblems"? It's a Classic Shell skin7 menu. No chance of a Windows menu - I use Windows 8.1u1, remember? And the shutsown icons are part of the Main bitmap - emblems came a few weeks too late ._. Also I've actually removed the text glow since that screenshot, so I could make the text itself white .___. Here are other XP taskbar textures: Luna Olive green, Embedded Blue, Zune-Royale Noir Black. Black taskbar text is more readable on Olive green. I've just created (may not be the best,) Windows 95/Classic Theme! File comment: And here is what it looks like! File comment: What my settings are at for the taskbar. File comment: The Taskbar Image. I added a new forum for the taskbar skins. Feel free to create new topics there. It would require a great deal of time for research. Time, I sadly don't have to spare at the moment.